Blueberries are one of those super foods about which we are told to consume more, but sadly most of us limit them to cereal and oatmeal. Given their current abundance fresh blueberries were used for this recipe and photograph, but the store bought frozen variety work equally well for those times of the year when fresh are not available. We even had a go at this recipe with fresh blueberries that we froze ourselves and they worked great. Our favorite source for Jersey Fresh blueberries and produce is Matarazzo’s Farmers’ Market. 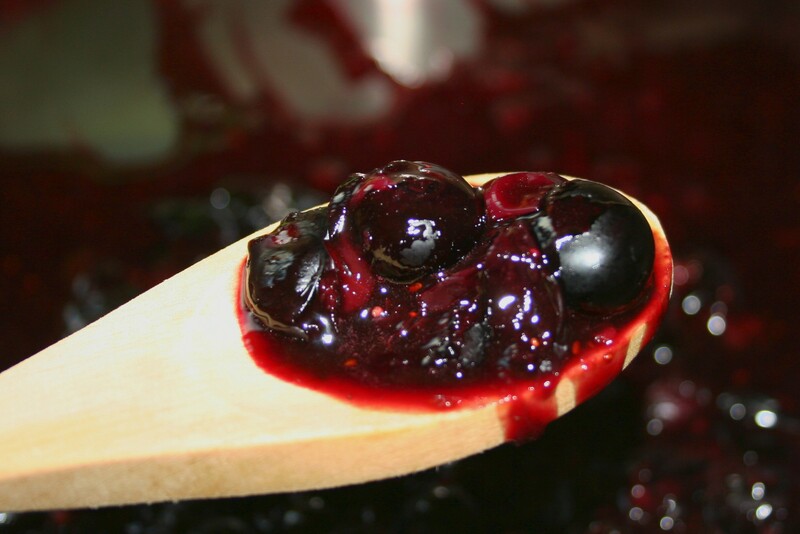 Sure there are lots of blueberry sauces and jams that could be melted a bit to make a sauce but more supermarket varieties are loaded with sugar or corn syrup. We’re keeping these versions as close to the farm as possible. For the balsamic vinegar we used the best Balsamic we could find from a small specialty store. It’s so much better than anything found at the supermarket and is so sweet and thick that it is possible to do balsamic shots. In a skillet over really low heat stir together the Balsamic and Maple Syrup, as they warm they’ll start to combine nicely. Add the blueberries. Stir to coat as much as possible. We’re not really looking to cook the blueberries as much as we’re just heating them through. Most likely it will seem that nothing’s happening, nothing’s happening, then oops, the balsamic mixture is bubbling up. At this point add the cinnamon and stir. With the back of a fork start smashing blueberries. Their juices will be released and add to the liquid portion of the sauce while the smashed inner fruit helps thicken it. Since this is all about the blueberries, I smash only half of the berries, leaving the other half fully intact. And pinch of salt is all that’s needed to complete the sauce. 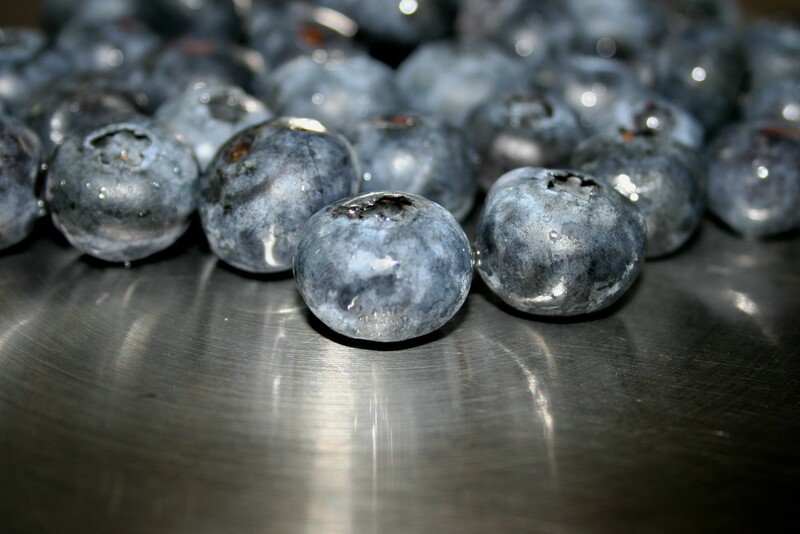 Those full sized blueberries scream homemade and will roll over the top of frozen desserts or plain cake beautifully! *If using a more tart balsamic you might have to add another teaspoon or two of maple syrup to balance the acid while the sauce is still very warm so it blends easily. John Lee is Black Tie and Flip Flops’ Raconteur-In-Chief: the World of food is his playground ~ the whole world! Having a Navy Dad gave John the passion to discover the world. Whether in one of Mr. Boeing’s flying machines, as an armchair traveler with a great book, or a plate beaming with the exotic flavors and fragrances, his day is all about discovering the world and sharing the stories with everyone he meets, and playing with his rescue dogs Ricardo and Rosalita. John is also the Director of Taste of Montclair, the Montclair Rotary Club‘s annual charity event where 100% of ticket sales go to charity.